A MAN has died as more than 80 firefighters battled blazes in a flat on a Millionaire's Row in west London, which is home to celebrity neighbours including Simon Cowell and Robbie Williams. 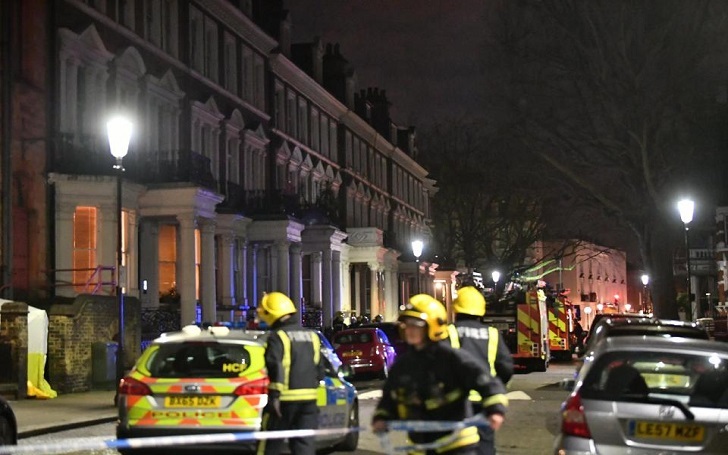 Twelve fire engines rushed to Holland Park Gardens in West London shortly before 10 pm yesterday night in order to douse the flames on the first floor of the building. LAS (London Ambulance Service) has confirmed that the man was pronounced dead at the scene. A total of eight properties including flats in converted houses were evacuated. An investigation has been launched under what caused the blaze. Eyewitnesses explained how the fire spread to a second floor at about 21:45 GMT. George Nicolas, who lives opposite the flats shared a tweet where he said that the fire appeared to have spread to the second floor of the building before being contained. London Fire Brigade confirmed that a second-floor flat was also damaged. It also said the cause of the fire was under investigation. LFB added that crews from Kensington, Hammersmith, North Kensington and other stations had attended.